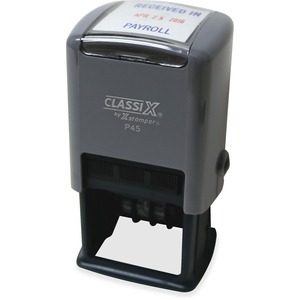 Classix P45 One-color Dater offer durable metal construction for heavy-volume stamping. Customize with a maximum of one line above date and one line below date. Choice of ink color includes black, blue, green, red and purple. Impression size is 1-3/16" x 1-3/16". Alignment marks and see-through base help place your message accurately. This custom self-inking stamp features a built-in re-inking system that automatically inks the stamp die after each impression. You can make thousands of repetitive impressions without replenishing the ink supply. Design also includes easy, slide-out ink cartridge with safety catch; durable ABS plastic and rubber feet.